Lotus Elise 1.6 driven | What Car? 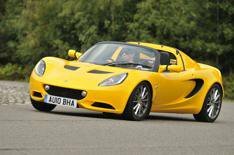 On the surface there doesnt appear to be a great deal new about the latest Lotus Elise. There are new lights that incorporate LED daytime running lights (and which bear a striking resemblance to those on the Ferrari California), plus new, lighter wheels and fractionally tweaked aerodynamics. So far, so minimal. The bigger changes are under the skin, because Lotus has fitted a new 1.6-litre Toyota-sourced engine with 134bhp doesnt sound much, does it? However, theres another crucial figure that is similarly low, and thats CO2 output at 149g/km, the Elise could well be the worlds first low-guilt sports car. Not only that, but itll do an average of 46mpg. Low guilt then, but not low excitement. Once youre up to speed, the Elise flows along a twisting road beautifully, gripping hard and changing direction quickly, with the unassisted steering telling you everything you need to know. It even rides well. The main problem is that it simply isnt quick enough, despite being barely slower on paper than the 1.8-litre version it replaces. Come up behind another car and you need a decent amount of space and planning before you can get past, which is frustrating in a sports car. This allows you to sit back and survey the cabin your 27k has bought you, which wont take long because its a bit bare. Still, order your Elise with the 2000 Touring Pack and cruise control comes as standard, so once youre up to speed you dont have to concentrate on keeping it there.